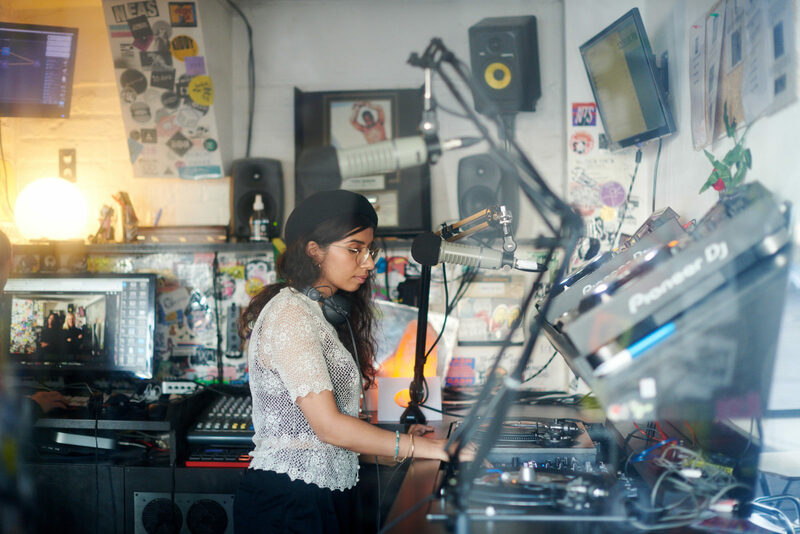 It’s about fifteen minutes before Nabihah Iqbal is due to start recording her bi-monthly show for NTS Radio and she’s standing completely still in London’s Gillett Square, which has been home to the cult station since it launched in 2011. 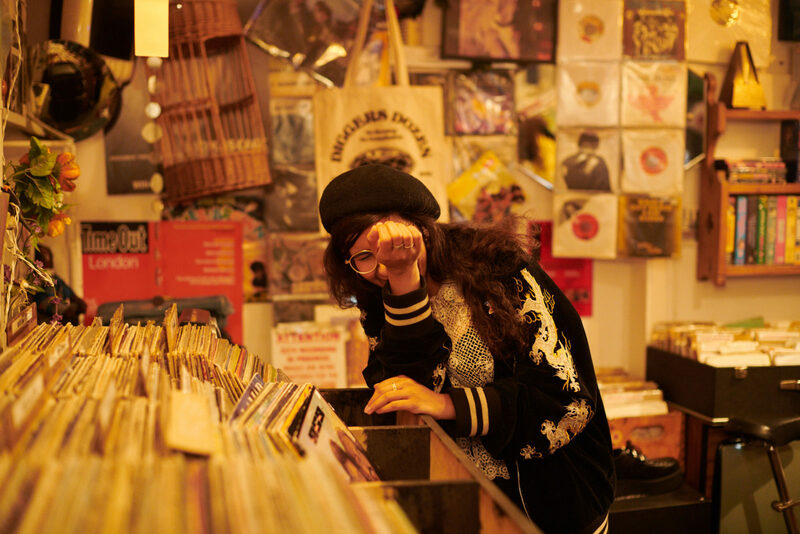 One hand resting on the handle of her indestructible-looking record case, the local characters that make Gillett Square one of the last true bastions of old East London mill around her. You can just about hear the closing tracks from the Charlie Bones breakfast show that proceeds Iqbal’s, partially obscured by the laughter from the man cooking food beneath a Jamaican flag next door. And in the middle of it all is Iqbal, seemingly taking everything in, perhaps calibrating a little. Yesterday she returned from a trip to Sierra Leone where she spent time with traditional bubu musicians; the week before that she was in Japan, DJing and digging through the shelves of Tokyo’s famous Dub Store Records for the vinyl that will make up today’s reggae-themed radio show. This evening she hosts a listening party with South Asian jazz percussionist Sarathy Korwar and tomorrow she begins her new series of talks with the likes of historian David Olusoga and artist Wolfgang Tillmans at Somerset House. Her stillness, though, is only fleeting because one of the main things that emanates from Iqbal is the sense of perpetually being in motion. Driving forwards. Pushing at the seams. It’s there in her seemingly endless travels to far-flung destinations and in her constantly-evolving creative output (there too, in her own constantly-evolving relationship with that creative output); her records, her live shows, her DJ sets, her radio shows, and even her social media presence are all testaments to this notion. Where once such thoughtless words would barely cause a ripple, this time, a weaponized, fed-up online community caused the backlash to morph into something more akin to a tsunami. It started with a tweet from a person in Canada who Iqbal had never met and, from there, BBC interviews, coverage in The Guardian, and an op-ed from Iqbal herself in the magazine Dazed and Confused, followed. Later that night, the listening party with Sarathy Korwar offers a glimpse of the transcendental experiences that Iqbal describes—experiences that Iqbal says she has been touched to hear about and see at her own shows since the release of Weighing of the Heart (“one of the most common messages I’ve been receiving is that the album is making people cry, making them think about things they haven’t for a very long time”). After a lively on-stage discussion, tabla, flute, and voice begin to flow from the vintage Klipsch speakers at venue Brilliant Corners. The crowd relaxes into hushed reverie. At the back of the room, Iqbal’s parents and little sister look on with pride. A lone dancer rises to her feet instinctively and begins to sway among the mostly bowed heads. Everyone within the packed room seems consumed by their own, individual negotiation of the sounds flooding over them. And at the front of the room, perched on a stool next to reams of notes is Iqbal. Eyes closed with movement fluttering just beneath the lids, she’s luxuriating in some moment that is, as she says, perhaps “hard to explain.” It’s a moment of stillness, driving something forwards. Formally known as Throwing Shade, Nabihah Iqbal’s first full length album, Weighing of the Heart, was released in 2017 to critical acclaim. The London-born singer songwriter will play at Babylon, Istanbul, on December 8th and Fellah Hotel, Marrakech, on March 28th. For more on Iqbal visit her website, or listen to her bi-weekly radio show on NTS. And don’t forget to read her article for Dazed and Confused on her experience of making guitar music as a British-Asian woman.